Buying, Selling or Restoring a Vintage Honda? 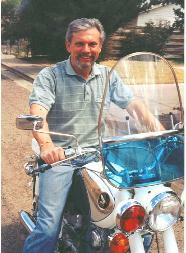 I specialize in all 1960-67 Honda 250-305cc models, including Dreams, Scramblers and Super Hawks. Since the 1990s, I have written several restoration & repair guides for the 250-305cc engines and the CB/CL72-77 models, which are available in print version only at the www.repairmanuals.com site. See below for details about my latest revised books available on digital download (Dropbox) which cover all models, plus complete engine repair, too. To Buy any Restoration Guide downloads, I can send a PAYPAL invoice to you or click the link at the bottom of this page. Problems? See contact info below. Honda 250-305 DREAM Restoration Reference Guide now available on digital download! 93 pages covering the 1960-67 CA72-77 Dreams, plus copies of the CA72-77 parts books, Dream owner's manual, photos and a road test from the 1966 CYCLE magazine edition. Over 2000 pages of information. Price is $69.95 and includes the 250-305cc Engine Repair Guide files. 51 PDF files, 620 MB. Now available, my new Classic Honda Motorcycles, previously published by Motorbooks International, but now available in a revised book. This book includes 220 pages of text/photos of Honda's most collectible motorcycles from the 1950s to 1990. $32 postpaid in the US and $56 anywhere else in the world. Ask about our new "HondArchives" video! We've combined 4 vintage Honda factory films into one very interesting video DVD!. Included is footage of the Honda factory and production of Honda Cub 50s motorcycles in 1967, the 1970 Daytona 200 race win for the CB750, a DVD + a copy of the DVD/VHS tape is only $40, postpaid in the USA. We have just uncovered rare Honda racing/training film footage from 1962 and added it to the DVD! I have over 100 PDF files associated with vintage Honda motorcycles, primarily 250-305 models, but also have copies of accessory books, owner's manuals, set-up instructions, Honda advertising used in magazines and on brochures and LOTS more. I can provide some extensive information on the Honda 160 and 350 twins now, as well as a file package for the Honda CB92 Super Sport models. I recommend visiting the Vintage Japanese M/C website (www.vjmc.org) for more information about ALL makes and models of vintage Japanese machines, including Hondas, as well as links to many other quality websites devoted to various makes and models. I can accept PAYPAL or VISA/MC/credit cards through PayPal for download and Book purchases, subject to certain restrictions. PLEASE STATE which version of the restoration guides you require, as each guide is specific to either the CA, CB or CL series machines. BR> In print only: Older, condensed paper versions of the CB/CL models and my Engine Repair Guide can be ordered directly from www.repairmanuals.com. Search my name on the site and the purchase options will come up for ordering. Each book is approximately 130 pages. For other specific files, contact me directly through contact information links below, please. Note: Use of the HONDA (tm) name is used for identification purposes only. This site has no affiliation with American Honda Motor Corporation or the parent, Honda Motor Corporation, Japan, in any way. Thanks for visiting this site page! If you need to speak with me, please call between 8AM to 8PM, Pacific Time.